I love reading novels about days gone by and walking through heritage homes and museums. It’s fun to let my imagination wander and wonder what life might have been like when everything was made of cast iron and wood. While working in the travel industry one of the things I have become very aware of is heritage tourism and the preservation of sites and natural wonders. Tours to destinations worldwide embrace history unique to their location; whether it’s a museum, heritage site or re-enactment they all help us understand history and offer a tangible link to the past. Restored historic sites and buildings contribute to the cultural and economic well-being of a community while their charm adds a sense of character. Staying in heritage hotels or inns is a great way to relive the past; walking the floors where our fore fathers walked or eating in the dining room where they would have enjoyed a meal. Two beautifully restored historic hotels; The Davenport in Spokane and the Embassy Suites (formally the Multnomah Hotel) are two of Wells Gray Tours favorites. The Davenport Hotel Spokane: http://www.davenporthotelcollection.com/our-hotels/the-davenport-hotel/history/ Opening in 1914, it was the first US hotel with air conditioning, a pipe organ, a central vacuum system and housekeeping carts. From its opening until its closing in 1985, The Davenport served as a landmark of elegancy and sophistication. After sitting vacant for many years the hotel narrowly escaped the demolition crews when Walt and Karne Worthy bought the property in 2000 and began a multimillion dollar restoration. The restoration process was thorough and accurate to ensure the hand-painted frescoes, ornate woodwork, genuine gold leaf around the lobby hearth and the year-round lit fireplace were restored to their original glory for future generations. Guest rooms are furnished with 1914 traditionally styled furniture and fixtures. Each room is beautifully appointed and your heart will skip a beat when you open the door of your room to days gone by. Embassy Suites Portland (formally Multnomah Hotel): http://www.pdxhistory.com/html/multnomahhotel.html This beautiful hotel has hosted 9 US President’s, Queen Marie of Romania and the King of Rock and Roll, Elvis Presley. Twice planes have taken off from the roof of the hotel, once in 1912 and again in 1995. 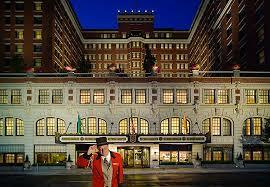 Occupying an entire city block in Portland’s business district the hotel was Portland’s largest until 1961. From 1965 to 1992, the hotel was home to government offices. In 1995 it was bought and renovated to once again operate as a hotel. Its ideal location in the heart of the city, proximity to excellent restaurants, shopping and business make it the perfect Portland stay for business travellers and tourists. New Years’s on Catalina Island!